Andy: There is nothing like the aroma of Pyrat. It is so unique and unmistakable. Trying this rum straight, I find it is a little harsh with a strong burn going down, which is ok, but it just doesn’t have the smoothness of a Mount Gay Extra Old. It does have a much more robust flavor though. Having this rum mixed with cola, gives a completely different experience. There really is nothing like it. It is sweet, but not too sweet and it has such an unmistakable flavor it really has become one of my favorite rums. So good…I would drink it straight out of a dumpster. Adrian: Pyrat could be my favorite rum. Mixed 3/4 Pyrat to 1/4 Coke, the taste is just awesome. There is a strong molasses overtone and a great spicyness that you wouldn’t expect. This is by far one of the most unique rums I’ve ever had, and bar-none the top on my list when I’m wanting some fun without breaking the bank. As you pull the cork, the rich smell permeates the room, preparing you for the joy you’re about to drink. Highly recommended as a drink that will wow you every time. Great review gents! Enjoying my 1st bottle of Pyrat, and it is tasty. I like it over a couple rocks. Would not ruin it with any soda mixer other than a nice ginger ale. Looking forward to trying the Mt.Gay Extra Old. Cheers! Amen. Your reviews are on point. Both rums are delicious and I will keep them both stocked. Great gifts for people you really like. As one of my favorites, this is my everyday rum. I challenge you to try this with Pepsi instead of Coke. Now that’s a drink! I agree with almost all of your reviews. I love Mount Gay Extra Old and Appleton Extra Old. I didn’t even know rum could be good before trying those. I’m usually a single malt / bourbon guy, so I’m sure that has something to do with it. . . but I don’t even consider Pyrat to be real rum. It’s a liqueur. It’s the artificial orange flavored Kool-aid version of Grand Marnier. That said, it’s fun to mix I guess. Love Pyrate. Will always have it as it ranks among my top three. However I find its spicing to be a little overwhelming straight. But no excessive burn or bite. Just smoothe once past that heavy flavour. So… I mixed it 1:1 with Mt. Gay XO; a rum I consider its best virtue to be that it has no flaws. I just find MGXO flavour a little unremarkable. But I digress. Back to Mixed. Unbelievable. Niether one on its own really does it just right for me. Together? Dayamn. Perfect. And why not. 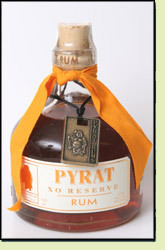 The makers of Pyrat just source aged rums from different distillers in the region. Wouldn’t be surprised if Mt Gay Distilleries was on the list. No need to even introduce a soda mixer as this duo will be WAY better than some Rum-n-Coke’s. Seems Coke mixing is a big part of the site. I’ll mix cheaper rums with the corn syrup crap they call a soda these days but I will, on occasion, mix a fine rum with some glass bottled Coca-Cola. Reason being it’s made with actual sugar. Now I gotta credit you two to enlightening me on what fine rums are. I dunno… Diet or any other than regular coke seems like herasy. There’s already so much sugar in your spiced rums. You ain’t savin a lot of calories. Glass bottled Coke. Comes out of Mexico. Real sugar. Look for it in the “Ethnic Food” section if not with the regular sodas. Over the last few years I’ve trained myself to appreciate spirits strait with out mixers or ice. I highly reccomend giving strait spirits a try. You’ll find you’ll discover subtlties and intensity in flavors that you would miss mixing with over powering sodas- plus it’s so much easier to just pop a cork and enjoy. I must say Pyrat is my go to rum. I can sip on a few ounces and get hours of enjoyment. There really isn’t anything not to like unless for some reason you don’t like a sweet rum with orange overtones. Pyrat has replaced Captain Morgan’s private stock in my bar and rum has replaced tequila as my go to summer spirit. I have to agree with the previous reviewer regarding corn sweetener. New Coke sucked the first time they tried to shove it on us in 1984 and the secret 2nd introduction of it was total BS. Now the majority of the steeple just keep drinking the slop and any of us with a refined palette are forced to but Mexican Coke. F–k corn sweetener and f–k ethanol blended gas! Love the Pyrat, only rum I drink. If you can handle some sweetness I’ve discovered a very dangerous cocktail to make with it. Call it a rumerita. 2 shots Pyrat, 0.5-1 shot agave nectar, juice of half a lime. This thing can get super sweet if you go with a full shot of agave but I guarantee you lose track of how many you’ve drank by the end of the night and the quality or the rum keeps the hangover minimal. I’d be curious what others think if this. Pyrat gets its apricot-like flavoring from the barrels it is aged in which previously held apricot brandy. A very smooth a fruity rum , many people think it tastes more like a fruit brandy than a rum. The distinctive flavor of this rum can stand on its own and can be taken ‘neat’. This is a very good rum. Goes for about $40 around here. Little expensive, but worth it if you want something different. I am happy to see others enjoy Pyrat. I haven’t used it to mix with anything, I just enjoy it straight. Interesting about the Apricot flavor coming from the cask having been used for Apricot Brandy. Pyrat was introduced to me as a sipping rum. I have a collection of the beautiful bottles. By far my favourite rum. This review drove me to try my first bottle… so I can’t thank you enough. I would recommend this rum to anyone looking for something unique and unforgettable. Cheers! Guys, great review! I grew up in Barbados and I love Mount Gay Extra Old (now just labeled Mount Gay XO) so when I ran out of the supply I brought back this year I wanted an alternative. I found your review when looking for a comparison between Mount Gay XO and Pyrat XO and I have to tell you, SPOT ON! The flavor is amazing and the aroma when that cork pops for the first time is amazing. I agree that it’s a bit harsh going down but it’s definately smooth enough to sip. The real kicker though is mixing with a little cola… Amazing! Pyrat XO will now have a place right next to my Mount Gay XO. Pyrat is a solid mass market rum from the same family of spirits as Patron tequila. Yes the source rums and blend them but nowhere does it say that they distill it or from what source, be it juice of sugar can freshly pressed or what grade of molasses. The same is true with Patron. Taken in bulk from Jalisco, you have a talented blender giving the product a house taste but you really don’t know if it’s been ages in brandy casks or Sherry casks. Oaking and flavoring S are very easy to duplicate especially with modern additives, but I digress. The pint is that Pyrat XO is labeled much like a Cognac or Armagnac but there are any legal requirements for this multinational rum to really have such a designation. The French have laws for everything grape related. Pyrat XO is a pleasant enough rum to drink neat, on the rocks or with better small batch colas like Fentimans. A splash of real Ginger Beer, like Goya or the spicier offerings from Reed’s and even a very good small batch root beer like Virgil’s is massively better blended into a base of Pyrat XO. Pyrat will always have consistency that you won’t find from all the other single distilleries that use a specific base be it cane juice or table grade molasses. At about $9 for a little 375ml bottle you should include this as a stocking stuffer for all your friends who enjoy rum. What a bargain. Just don’t confuse this with a single distillery product.